rapid-fire bursts of kaleidoscopic imagery assemble into fractured collages where a moment expands outwards and then converges back into itself, fleshing out a three-dimensional rendering of place. Each day, hundreds of pilgrims travel by airplane, train, car, rickshaw and foot to reach this shrine, which honors a 12th century Sufi mystic who believed in drawing close to God through renunciation of the world and service to humanity. Beginning with imagery from these journeys, the film then enters the physical space of the shrine; a unique nexus of marketplace, social space and spiritual haven, where devotees come to offer their prayers and find a moment of reflection away from the din of Delhi traffic. As the sun sets behind the dome, musicians begin the qawwali, a style of Sufi devotional music that ranges from contemplative religious elegy to raucous crescendo. About the Saint: Hazrat Nizamuddin Aulia, affectionately known as Mehboob-i Elahi or "Beloved of God," was born in Badayun, India, east of Delhi. His grandparents had migrated there from Bokhara. When he was a boy of five, his father died. As a teenager, Hazrat Nizamuddin Aulia distinguished himself as a scholar, a debater, and a student of the Koran. But he increasingly was drawn to the inner life of the mystic. 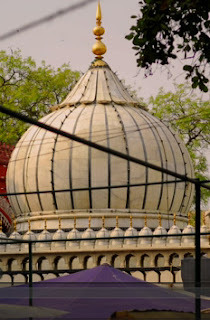 When he was eighteen, Hazrat Nizamuddin Aulia encountered a group of Qawwalis (Sufi singers and musicians) who introduced him to the Chishti Sufi order and the teachings of Baba Farid, and soon became a disciple of the group in Delhi.